Ever wondered why tablet sales are going down? Ever thought that your laptop was insufficient for your needs? Moreover, have you ever wanted to run two Android apps side by side simultaneously to facilitate true multitasking? Ever since portable technology has taken birth, manufacturers have tried and failed consistently to produce a device that effectively takes care of all your on the go needs. Now, Idealfuture, a small technology company wants to change that. Their answer? The Dragonfly Futurefön. This product from Idealfuture Inc got the tech geek in me going dead crazy after a very long time and should get you super excited too! The Dragonfly Futurefön is an all in one Laptop-Tablet-Smartphone Hybrid aimed to cater to all your portable tech needs. The Dragonfly is essentially a transformer straight out of a science fiction movie. If you thought Lenovo’s Yoga line was cool, the Dragonfly will blow your mind. 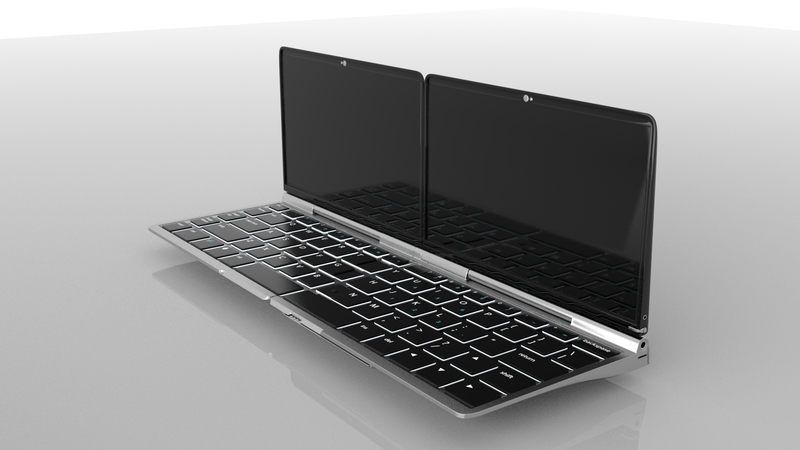 The device features a unique folding mechanism that allows it to expand into a laptop with a full sized keyboard. There is a slide out trackpad and also a stylus built into the device to interact with what is on screen. To best understand how this works, check out the video. With a dual display setup, multitasking becomes the main objective. You can opt to take a Windows-Android setup that will let you run Windows on one screen and Android on the other. Aside from that you can even run two Android apps side by side or one app split into two displays. At this point we should mention how the whole Smartphone + Tablet system works. The display on the right is removable and is called the Slingshot. The Slingshot is a 7 inch Tablet/Smartphone running Android and is built to be used like your everyday smartphone, albeit a massive one. As it is apparent that holding a 7 inch device to your face feels and looks weird, the Dragonfly comes with a bluetooth headset that actually fits into the whole module around back. The Dragonfly Futurefön is an extremely elaborate device and would require a 10 page article to cover properly so for further details check out their Indiegogo page here. For $300 you can grab the Android only version and for $400 you can get the Windows+Android version. There are also a lot of perks that you can add on to improve your Dragonfly experience such as more RAM or storage. As excited as I am about this new device, I am more worried about its future. The company posted an Indiegogo goal of $10,000 and has already raise $515,735 which is 5157% more than the target as of writing this article. Right now the company is targeting late Q1 – early Q2 2015 for launch but even with the necessary funding, it must be taken into account that there may be significant delays. What worries me more is the software experience, no one has tried such a crossover before and as such, many design and user interface challenges are presented. Furthermore, the size and shape of the whole device is odd. Two 7 inch screens slapped side by side makes for an awkward laptop experience and a single 7 inch screen for a smartphone sounds ridiculous. Imagine watching a movie on a 7 + 7 inch display with a bezel in between them. Regardless of my worries, Idealfuture must be applauded for thinking way outside the box and coming up with such a unique product. The company already has more than the necessary funds so all we need to do now is wait for them to execute and pray for positive outcomes.